Most cookbooks write their recipes using the standard English measurement system, with units from dashes to pinches to cups. There are even two descriptions of ounces -- dry and fluid. 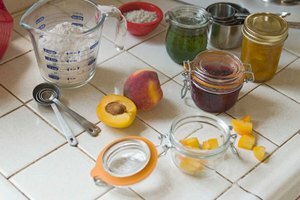 Sometimes when cooking or baking, it’s necessary to convert ingredients from one unit of measurement to another. Not knowing how can make you want to pull your hair out, particularly when you have three different pots boiling and a screaming toddler on the loose. Figuring it out is simple, if you know the ratio and have a calculator. 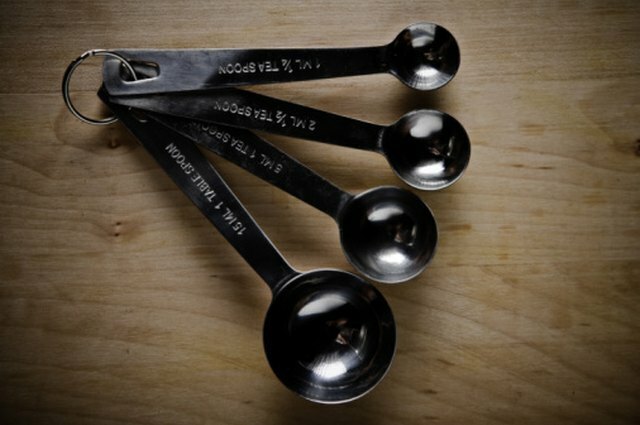 Convert dry ounces to tablespoons. Look at your recipe to see how many dry ounces are called for. Enter the number into your calculator and multiple by 2.38. The answer will give you the number of tablespoons. 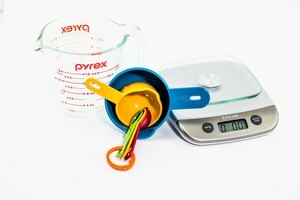 Convert tablespoons to dry ounces. Look at your recipe to see how many tablespoons are called for. Enter the number into your calculator and divide by 2.38. The answer will give you the number of dry ounces. Make sure that you are converting dry ounces and not fluid ounces -- the ratio for fluid ounces to tablespoon is 1:2. Always measure twice before you add an ingredient, it's much easier to add than to remove.